(0 Customer Reviews) | Write Review 6 issues per year Food & Drink is the free customer publication for customers of the LCBO, Ontario’s provincial beverage alcohol retailer. It is dedicated to the art of entertaining, inspiring readers with tempting recipes and the latest information on wine, spirits and beer. 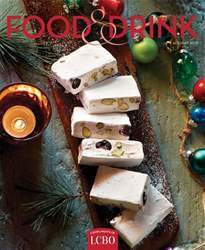 Food & Drink‘s experts equip readers with sophisticated yet accessible entertainment advice and tools for relaxing or socializing with family and friends. Beautiful photography and relevant articles are to create a guide for entertaining that readers refer to time and time again. People love Food & Drink and it has always been a coveted item for LCBO customers in stores and now is available digitally. READY FOR THE HOLIDAYS: Pace yourself with one project for each of December’s five weekends. A PORTABLE PARTY: A completely totable menu for a potluck with style. TWICE AS NICE: Cookies do double-duty—as treats worth celebrating and also as components in more elaborate desserts. TASTES OF THE SEASON: Infuse mains and desserts with festive evergreen and herbal flavours. A LITTLE LIGHT LUNCH: This light midday meal will keep you satisfied leaving room for Christmas dinner. TRANSFORMING TURKEY: Treating leftover turkey as a prime ingredient, sensational dishes that transcend the concept of leftovers. SMALL PLATES, BIG NIGHT: Keep the food coming all through New Year’s Eve with small-portion courses. Plus, so much more to help make your entertaining this holiday the best ever! You'll receive 6 issues during a 1 year LCBO Food & Drink magazine subscription. You'll receive 6 issues during a 1 year LCBO Food & Drink magazine print subscription.